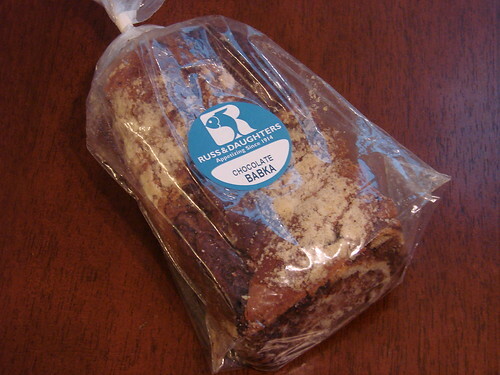 Without a doubt Russ & Daughters' chocolate babka is the very best Blondie, Lawman and I have encountered. This delicious streusel topped cake was moist with plenty of chocolate ribbons including a fudgy chocolate layer at the bottom. Yes, a fudgy chocolate layer. It would be easy to put this entire cake away in one sitting. Alone. Whether you're celebrating Jewish Christmas or Gentile Christmas, a chocolate babka from Russ & Daughters makes for a perfect breakfast treat. They're open on Christmas Eve and Christmas Day, so what are you waiting for? looks wonderful...I have always liked the one sold by Zabars and it is actually sold in a local supermarket in my hometown so I can get it locally and cheaper. I believe it was Greens Babka. I will have to try to find this one to compare. Russ and Daughters, ok I'll pick one up the next time I walk by. 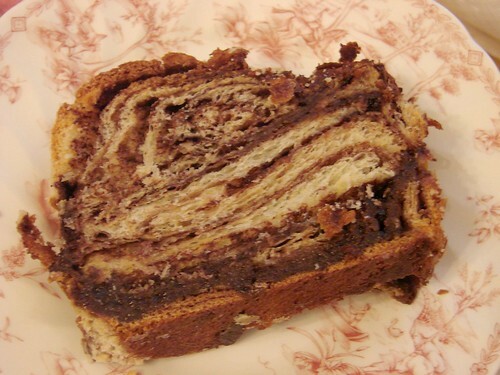 Have you ever had the Barney Greengrass babka or mini babkas? Salty thing going on w/ those. Congrats on the grand prize for awesomeness! Good post, nice blog. Thanks for share useful information. I like this post. No Way!!! I got a Cinnamon Babka to bring for the holidays from Russ and Daughters. I had always bought Dean & Deluca up till now. Russ and Daughters was so much better IMO.